I played a lot of point-and-click adventure games when I was younger, and they have always held a special place in my gaming heart. 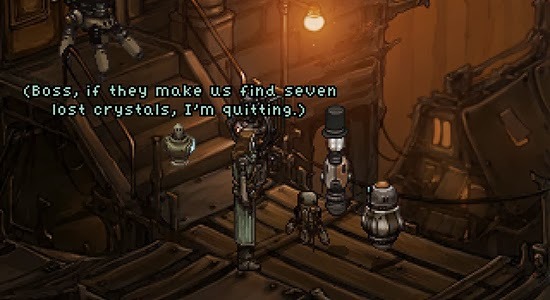 Primordia, and many of Wadjet Eye's other games, feel like a tribute to the old point-and-click games from Sierra and Lucas Arts, adopting the same low-resolution (8-bit) art styles that make it feel like a product of that time. 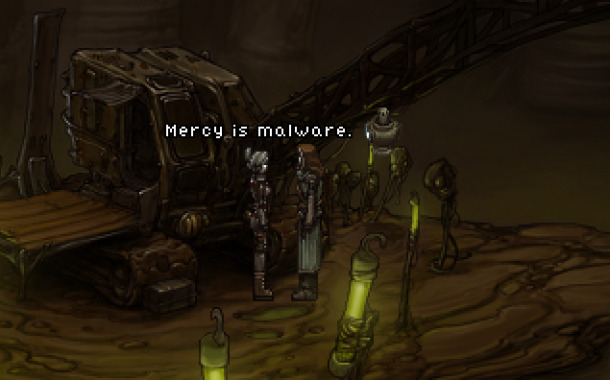 Primordia has a more serious tone than many of those earlier titles, but is certainly not without its humor. 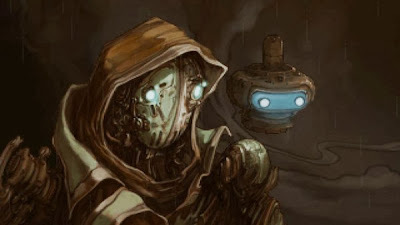 Taking place in a world where all the humans have mysteriously disappeared, leaving their robotic creations behind, Primordia is a tale of loss and self discovery that touches on some fairly serious issues without pushing them too far or attempting to achieve a certain agenda. You play as a robot named Horatio, with a rather witty companion named Crispin—who provides the majority of the humor throughout the game—on a mission to recover something taken from you. As is normal for adventure games, you'll be doing a lot of puzzle solving. For the most part these puzzles are well engineered and figuring them out can give you a sense of reward. Unfortunately there was one puzzle early on that was so counter-intuitive that I could not figure it out without looking online for a walkthrough. When I found out what I was supposed to do I was so upset that for a while afterwards I just expected each puzzle that I couldn't immediately figure out to have some inexplicable answer. Another puzzle soon after did fit into the "inexplicable answer" category (while grease is itself sticky, it is also a lubricant; it does not make things stick, it makes them slick), which annoyed me even more. However, after this second time I never felt the need again and soon was caught back up in the universe and enjoying the experience. The variety of puzzles was also quite refreshing for a point-and-click. It wasn't all looking for just the right spot to use a certain item, or constantly combining things together to make the object you really need. I was pleasantly surprised to discover that there were some puzzles with multiple solutions, with varying effects on the story. I found this out accidentally when I did something I didn't expect to work, and when it did I was somewhat horrified (at the result) and excited (that it worked)! I loaded a previous save and tried a different approach to the problem and that worked as well! As small of an effect as those different solutions might have had on the story, it made the world feel more substantial, and my actions more impactful. Even more impressive is the fact that there are several different endings to the game, some of them quite dark. Although the feeling of each ending is different from the others, and one particular ending is clearly the "best", they are all viable endings with none of them being considered "wrong". For an indie game I was seriously impressed with the quality of the voice acting. As soon as he spoke I recognized Horatio's voice as Logan Cunningham, well known for his work as the narrator for Bastion. With music that set the mood for each scene just right and the impressive (if 8-bit) visuals, Primordia is a solid experience all around. Overall I would highly suggest Primordia to any fan of the genre. The level of nostalgia I felt playing this game is a serious compliment to its designers and has only made me anxious to try out more of their other titles.